A value kit of travel sizes that will take away any worries about mixing your Vitamin C & Retinol. This combo of C.E.O. Vitamin C Rapid Flash Brightening Serum & Luna Sleeping Night Oil is perfect for brighter, healthier skin. C.E.O. Vitamin C Rapid Flash Brightening Serum: Is targeted to quickly fight the look of dullness, dark spots, and discolorations at the source, while diminishing the signs of aging. Luna Sleeping Night Oil: Luna works throughout the night to deliver visibly youthful, luminous, even-toned skin in the morning. AM Application: Apply one to two pumps of C.E.O. Vitamin C Brightening Serum to clean skin and follow with your favorite Sunday Riley moisturizer. PM Application: Apply three to four drops of Luna to clean skin and massage until the color changes from blue to clear. Wait 5-10 minutes after applying Luna and follow with one to two pumps of C.E.O. 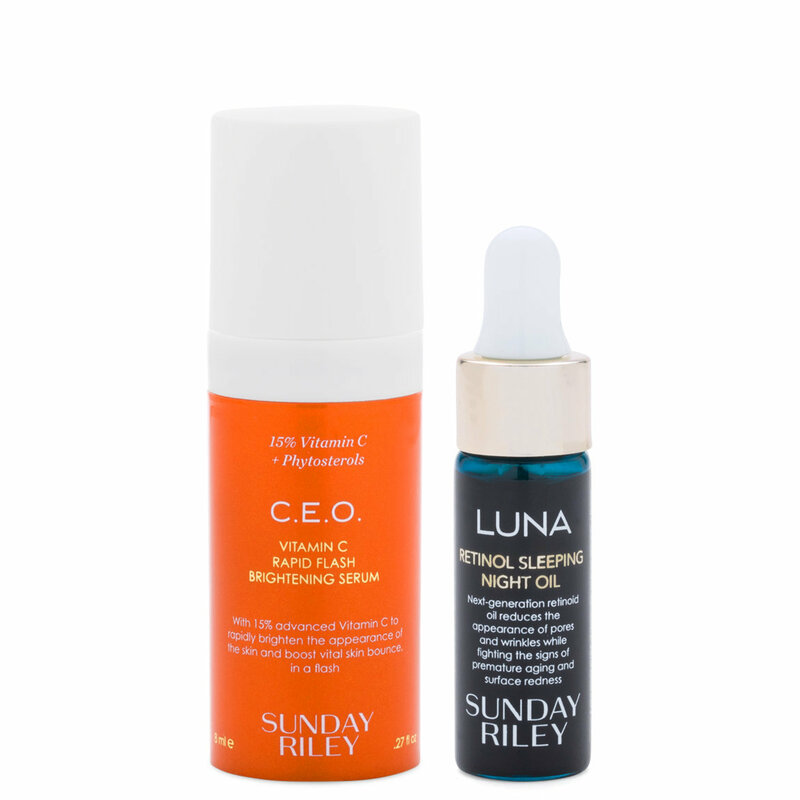 Vitamin C Brightening Serum and your favorite Sunday Riley moisturizer.